Cregor spent his whole life competing in speed events. At the age of 23, he was retired from competition, and it didn’t take long for him to start going downhill. He moped around his pasture and his general condition began to deteriorate. At 24, we decided to get him back doing what he loved. We started feeding SmartFlex Senior and saw a big difference after only a week. After a month of the SmartFlex Senior and legging up Cregor seemed to be feeling even better. His joints, hooves, coat and general body condition all seem to be better than they were years ago, even though he’s older. 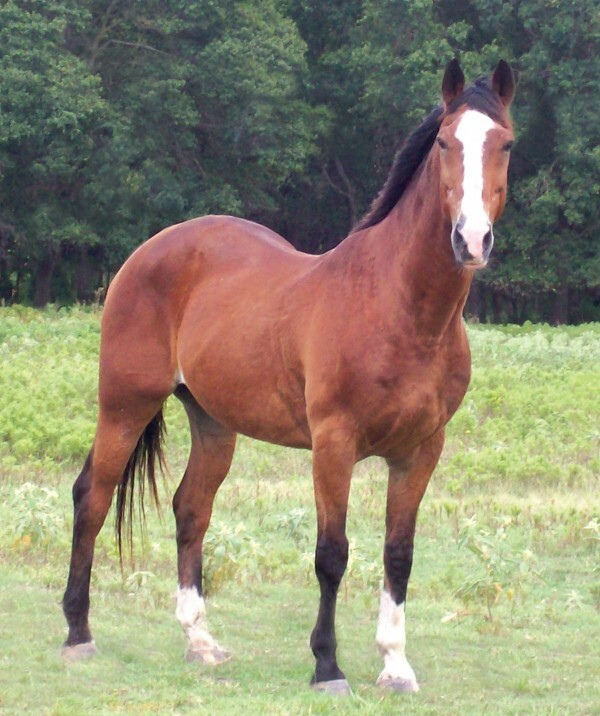 At 25 years old, Cregor won a saddle and numerous buckles (not to mention a few checks at barrel races)! At 26 & 27 he won another saddle and even more buckles. Now at the age of 28 he is still running strong and has won a buckle in poles. SmartFlex Senior has helped us keep this horse running and competing, which is exactly what he loves to do. I truly believe that SmartFlex Senior has made it possible for Cregor’s body to keep up with his competitive, big heart! I love, love, love this product and I recommend it to anyone who asks how in the world ole Cregor keeps on going like he is! Thank you so much SmartPak! My parents gave me my first horse, Arabian, Taroni #17639 (Tawbu x Faroneka), chestnut, as a high school graduation gift in 1964. My folks, friends and I enjoyed riding her for years, didn’t show her (she wasn’t dependable getting in the trailer even with repeated training but did go on a trail ride with our Half Arabian Club of Washington), and I bred six foals from her and two from her daughters. They did well at the shows and one, Khareeb (by Khemosabi), dark bay, went to Colorado and was a Champion in many disciplines–Halter, Western, English, Formal and In-Formal Driving, etc., and went on to the U.S. Nationals. He sired 40 registered foals. Those foals did well at halter and in performance–many also went on to reining and cutting. won a photo contest with that photo. In the early 90’s we sold our remaining Arabian horses. A year later we began boarding Arabians at our place, including stallions, for a man from Portland. He had his horses with us for 15 years. After a few months without horses, the barn was too lonely and I checked out an Internet site. To my surprise there was an ad for two Arabian mares with fantastic pedigrees–a pure Polish mare with 4 lines to *Bask and about every other pure Polish top show horse close-up: *Aladdinn, Gdansk, *Czester, *Boltonka, etc. The other mare listed was a daughter of a top halter stallion, Kaiyoum (Khemosabi x Bayanka (Bay-Abi x *Bachantka)out of Talaena, daughter of Egyptian import, *Talal. Both mares had a successful halter career and Kaiyanka was listed as a Champion Mare in a magazine article and was shown by Paragon Arabians in 1987 when two-year olds could win Champion Mare–she was competing against from 16 to nearly 30 entries in all classes! Both mares were broke to ride and had had three foals. I called and they were right in our neighborhood–maybe two or three miles from us! I went to see them on a cold January day in 2007. The ground was slushy from snow that week. So, in March of 2007, we began our swan song with our last Arabian horses by purchasing GW Silver Essence. Then owners begged us, on bended knee, to “please take Kaiyanka, she’s Silvie’s buddy”! She was very thin and 21 years old while Silvie was 16 years old. After a regimen of worming, updating shots, getting their teeth done, putting them on Senior grain and orchard grass hay (one mare gets the runs on anything else), we saw dramatic improvement in both mares. In addition, I began riding the old mare (younger mare needs more groundwork I haven’t had time to do yet) and she was no longer straight in the pasterns (and stiff to ride)and I think even her shoulders got better slope to them. She now has a very comfortable trot and canter. I was just learning about SmartPak products a year later and decided to use SmartPak Senior and SmartPak Hoof. However, instead of feeding it all at once, I split the amount between morning and evening feeding. It is amazing to see Kaiyanka, now 26, when I first saddled her up last year, after all our rain quit. I decided to longe her first–she was so full of pep she bucked and kicked out and ran around full speed! Took her back to the barn, put on the bridle and got on her and away we went. During the day both horses are outside for maximum exercise. It’s great that Kaiyanka looks so good and has such energy and is happy. I might consider adding SmartPak Joint supplement, too, with the other SmartPak supplements. I’m very pleased with how well the Senior and Hoof products work. Silver Essence also receives them–our farrier says their hooves are in excellent condition. When I compare how the mares look now with the sales promotion DVD I was given by the former owners, there is a big improvement. Both have added presence and elevation at the trot and don’t just plod along–they are showy Arabian horses once again!